Our ultimate carry-on comes in two sizes. 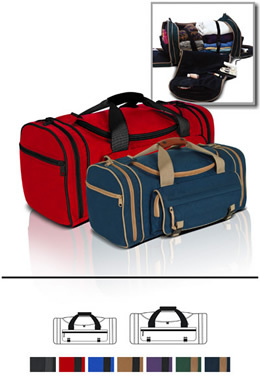 These are the ideal bags for the traveler who likes to keep all their belongings together and well organized. The oversized main compartment zipper extends all the way to the base of the bag to give you full access to packing. When you unzip either bag, a 3- pocket mesh organizer is exposed under the main opening for storage. Well thought out organizers are also positioned in the end pockets creating space for anything imaginable. Design and durability make these bags unsurpassed traveling companions.